Poo Doo Leash - Pet Waste Carriers Are you freezing your pet? Winter is here folks! Playing outside this season with Fido can be great fun. I love taking my pack out trail running and playing in the occasional snow. My husband and I were discussing how long should we leave our dogs outside in the yard, and it got me to thinking about when is it too cold? 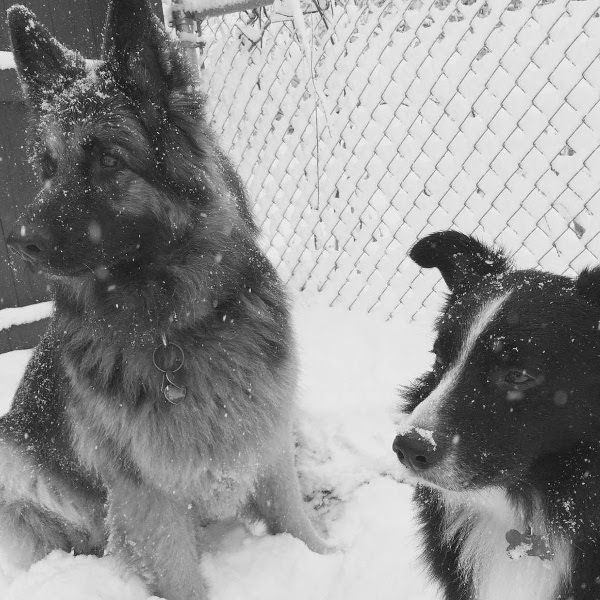 Can my German Shepherd stay out longer than my Border Collie? What are some warning signs, and what are some ways that I can keep them warm when the temperature drops below freezing. I did a little reading and found some practical advice, and warning signs. 1) Barking or a yelping: If your dog suddenly starts to ‘talk’ to you, and looking you dead in the eye’s, he might be trying to tell you he is in discomfort. 2) Anxiety: When many dogs get too cold, they will begin acting anxious or fearful. He may try to climb up your leg to be held, or may turn around and head home. This type of anxiety may turn into whining and barking. 3) Shivering: An obvious sign that he is cold. Generally breeds that are from northern, colder climates (Alaskan Malamutes, Siberian Huskies, Samoyed) are going to have fewer problems with cold weather. Dogs that are not used to cooler temperatures may not tolerate the cold even if they have heavier coats. For example, a Siberian Husky from Florida, may be uncomfortable in cold weather because he is not accustomed to it. 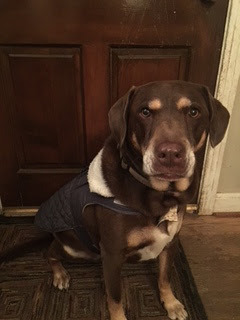 As a general rule, dogs with shorter coats (and no undercoat) will not cope well with frigid temperatures. Short-legged or toy breed dogs who have to wade or jump through deep snow will get cold and tired quickly. Puppies, elderly dogs, and dogs with health problems have an increased risk of getting hypothermia. Dogs who spend any time at all outside also need water that won’t freeze. There are excellent heaters available; check your local pet store. A high fat food will also help him deal with low temperatures because fat is an easily metabolized source of energy. If you and your dog go for walks in cold winter weather, think about dog boots and a jacket. If you walk near roads that are treated with de-icers, clean his paws with a warm washcloth when you get home. Salt and chemical de-icers can cause problems if he licks his paws clean. If his paws seem to stay damp, a dash of unscented baby powder can help dry them. There are a few tried and true ways to keep your pets warm while inside your home (besides upping the thermometer). 1) Blankets- Small dogs especially love to make nests and burrow in blankets (although my 70lb labrador joins in). Leave a few extra blankets on your couch, bed, and pet beds so your pooch can hunker down when he feels a little chilly. 2) Clothes-Dressing your pet sometimes gets a bad rap, but clothes really can serve a great purpose–to keep him warm! If you’ve got a cold companion, don’t be afraid to experiment with different apparel. 3) Pet Beds- A bed that gets your pet up off the floor can do wonders for keeping him warm (heat rises!). For extra warmth, look for beds that have fleece lining or simply add a fleece blanket. If you have a senior or arthritic pet, look into getting a heated pet bed. In general, if it is less than 40 degrees outside, leaving your furry friend outside for a prolonged period of time can be harmful. Know what is normal for your Fido to keep him safe in frigid temperatures. Now get out there, and have some winter FUN! For being a loyal customer, Poo Doo Leash is giving 10% off this month with the coupon code “winter” at checkout. 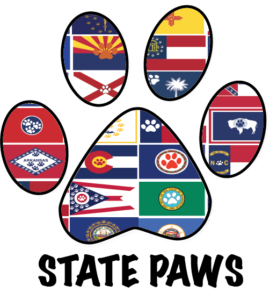 Our Christmas drawing for a great prize from my new design line “State Paws” is December 12th. Have a wonderful holiday season!